When I walked away from teaching music in 1999, I knew there had to be something better than what had become 21 years of grueling routine class work. The problem was deciding what direction my life would take. I was 42 years old and needed to find myself again. My husband and I traveled regularly in Europe and France was always part of the itinerary. The only problem was I couldn't speak or understand the language. Although I'd had a minimal exposure to pronunciation when singing in French, I was frustrated by not being able to communicate except via a phrase book. In 2001, a chance encounter with a Parisian French teacher at a New York City warehouse sweater sale changed that forever. What I didn't know at the time was that many other things were about to change because of this encounter. At the same time my interest in cooking and baking became a passion. There was a great supermarket not far from where I live that offers excellent cooking classes, some of which were given by celebrity chefs. I attended so many courses that the people at the company would recognize my name whenever I called to register. It became apparent I could combine my love of France and the French language with my love of cooking. Perhaps it was when I was savoring a coffee éclair at a patisserie in Paris when it occurred to me that I could bake it at home. I also realized I wanted to learn to bake it in France. I was finally onto something! After a disappointing experience with a class in Paris in 2004, I started to look for a school that would combine language study and cooking. Life kept getting in the way of my quest until the spring of 2009. 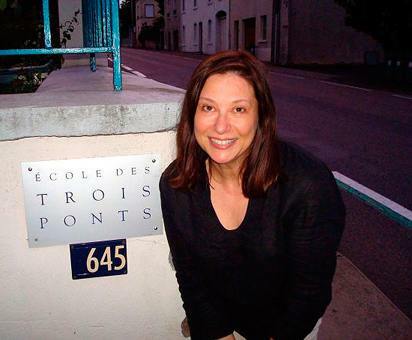 A Google search came up with L'École des Trois Ponts in Riorges, Grand Roanne. In a semi-rural area about an hour from Lyon, the school gave French immersion courses not only for language study but for cooking and baking as well. In a flash I was enrolled in their French study and baking week. Plane and train tickets were booked in rapid succession and I set out for my big adventure. Before my arrival, I took an assessment test so the school could put me in a class where I'd feel comfortable yet challenged. I was placed in a group of six people of varying ability levels, from just past beginning to intermediate ability. There were other classes for beginners and more advanced students. I was pleased with my placement. Valèrie, my teacher, guided the class through vocabulary, pronunciation, and even some grammar lessons with a sense of fun and purpose. I don't think any of us ever felt especially nervous or self-conscious during our lessons, although the situation was fraught with those possibilities. In twenty hours of intensive work my language competence took a giant leap forward. Headed by "Un des Meilleurs Ouvriers de France" Chef Alain Berne, our pastry and baking classes were engaging, at times exasperating (for me) and always enjoyable. I found puff pastry and I would have to wait for a future class to establish a good relationship. And I discovered that a brioche cake swathed in pastry cream is not beyond my technical capabilities. That is, as long as I remember to put the top layer of the cake right side up instead of wrong side down! Who were my classmates? There were two American mother-daughter combinations, several other Americans, Australians, a woman from Spain, and an English/German couple from Frankfurt. Although we were from different backgrounds, our common love of French and baking drew us together. A talented chef prepared lunches and dinners for us and good local wines, naturellement, always accompanied them. Five cheeses were served at every dinner, each one from a different region in France. They were so irresistible that I gave up any thought of dieting and tried every single one. It was impossible to pass up the opportunity to sample 25 cheeses in five days. Although all of our desserts were from the pastry class, it was all I could do to take more than a bite or two. Incredibly, I lost 4 pounds on this trip. Maybe it was that fabled French Paradox at work. At the end of the course I had two more days before going home so as planned I took the TGV to Paris. From checking into the hotel to taking the taxi to the airport I was mostly able to express myself in reasonably good French. It was a real breakthrough. What will all of this new knowledge do for me? I'm not 100% sure at the moment. A few months before going to France I had three recipes published in a university cookbook. I've had an essay published in a book about the history of entertaining. I know I will be baking brioche cakes for anyone who asks and that I'll continue my language studies with my private teacher in New York. I plan to return to Trois Ponts for more immersion in French and pastries. Perhaps a new career looms before me or perhaps this is all just for my own intellectual development. Whatever the future holds, I'm more than ready. Who'd guess that shopping for sweaters could end up changing my life! See www.3ponts.edu for further information about L'École des Trois Ponts. Australian Gourmet Traveller - Parlez vous francais?